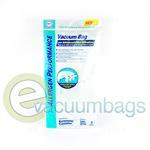 Genuine & Generic Vacuum Bags for Hoover & Bissell Vacuum Cleaners. Welcome to eVacuumBags, your number one source for vacuum bags, belts, filters, hoses, power cords, brush bars, and dirt cups. The eVacuumBags team works hard to ensure we carry the parts your vacuum requires, while handling every order in a fashion that supports our customer’s individual needs. Though we have been in the vacuum cleaner industry for over 10 years, we are delighted by continuing our education daily and carrying supplies for every single vacuum cleaner brand including Oreck, Kirby, Bissell, Eureka, Hoover, Miele, Dirt Devil, and more. Our knowledge spans over a hundred years of vacuum cleaner models and we are prepared to answer questions regarding repairs or parts for even the rarest of models. 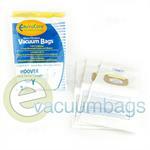 From Bissell Vacuum Bags to Hoover Vacuum Bags, we’ve got it all. Need parts for your computerized iRobot vacuum? We’ve got them! What about your 60 year old Advance vacuum cleaner? Parts are in stock for those models, too. From flat to geared belts, generic or genuine vacuum bags, or even replacement power cords, eVacuumBags has it all at the right price and ready for same-day shipment. While we do carry a wide selection, our shelves are ever-expanding to bring you the most robust selection of vacuum parts and accessories available. If you do not see the part you are looking for, we can order it, just let us know. At eVacuumBags you won’t just find those popular brands that are found in stores across the country. 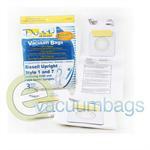 You will also find a full selection of vacuum bags and parts for the rarest brands manufactured. Our friendly and knowledgeable staff are well trained and provided with all the resources necessary to answer your vacuum cleaner questions. Should you need assistance in finding the right part for your vacuum, give us a call or send us an email and we will be glad to help. Generic EnviroCare Paper Vacuum Bags, with Convenient Dust Window, for Bissell Upright Style 1 / 7 and Samsung 5000 / 7000 Vacuums. 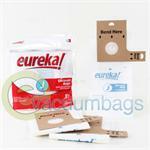 Genuine Style J Paper Vacuum Bags for Eureka 2270 & 2900-2920 Model Vacuums. Type Q Platinum Collection HEPA Media Vacuum Bags for Hoover Platinum Collection Lightweight Bagged Upright Model Vacuums. Generic EnviroCare Micro Filtration Paper Vacuum Bags for Hoover WindTunnel Upright Vacuum Cleaners Accepting Type Y Bags. 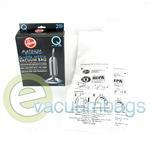 Generic Anti-Allergen Synthetic Filter Media Vacuum Bags for Kenmore 5055, 50557, and 50558 Model Vacuums. 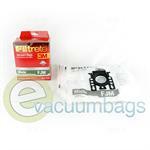 Filtrete 3M Synthetic Vacuum Bags for Miele Canister Vacuums using Style FJM bags. (see full description for list of models).